Greater Shepparton City Council has prepared a map of parking locations in the central Shepparton area. It also includes designated accessible parking bays, toilets and mobility scooter recharge stations. 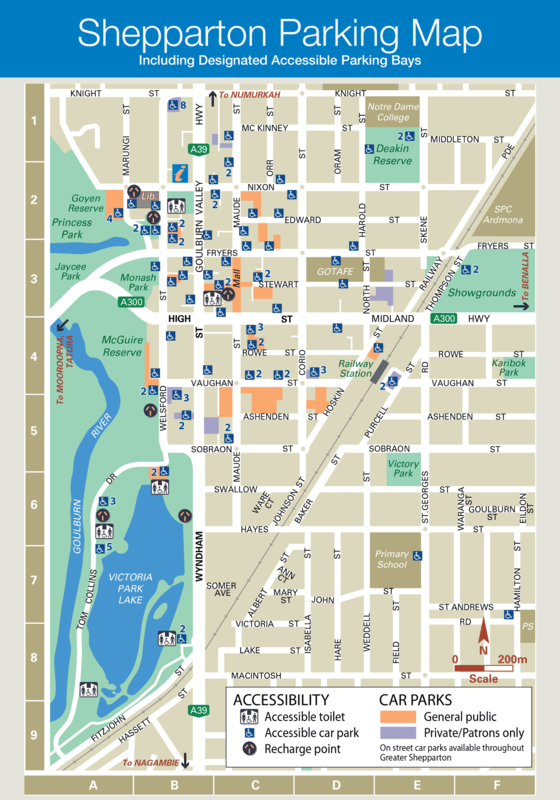 View an enlarged image of the Shepparton Parking Map, or download from this page in PDF format. View an enlarged image of the Shepparton Disabled Parking Map, or download from this page in PDF format. Download the Shepparton Parking Maps from the link below. You can also use our interactive Accessible Facilities Map to find accessible parking spaces in all of our towns across Greater Shepparton. The RECHARGE Scheme™ allows people to safely recharge their electric mobility scooter or wheelchair battery, free of charge. For more information please contact Council or visit the Recharge Scheme website. For information about applying for a disabled parking permit, please visit our Disabled Parking page.